The increasing globalisation and the changed international security situation have prompted the World Customs Organisation (WCO) to create global framework conditions for a modern and effective risk management in customs administration through a ‘Framework of Standards to Secure and Facilitate Global Trade’ (SAFE). An important element of this security initiative is the introduction of the status of Authorised Economic Operator (AEO). The objective is the securing of the entire supply chain from the manufacturer of goods to the end consumer, with only AEO certified entities having access to shipments. 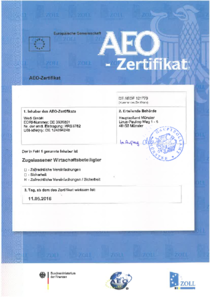 Companies with this certificate are regarded by customs authorities as being particularly reliable and trustworthy. They therefore enjoy particular privileges with regard to security-related customs controls and can claim simplification in customs clearance. The global recognition of the certification is planned, but even now it is not only globally active companies who are recommended to cooperate with other AEO certified companies. Our successful certification contributes to the security of your supply chain!